Although, back acne unlike facial acne, is less exposed and seems more manageable, esthetically wise, since most of us wear clothes on most occasions when we go out, back acne is still a big problem for many acne sufferers. Just the thought of having to take the shirt off at places like the beach or the gym makes back acne sufferers quiver. If you suffer from back acne and have struggled to find a permanent cure with little to no results, you came to the right place. After suffering from severe acne on my face and back and after more than 7 years of dedicated research, trial and experimentation I have found a permanent solution, not just a relief, to my acne including my back acne. In this report I will reveal why you have back acne, the difference between back acne and facial acne and how you can finally get rid of your back acne nightmare. Back acne manifests itself in all types of acne: blackheads, whiteheads and more often large cystic acne that spreads deep into the skin layer. Back acne is a painful and annoying, more prevalent and more difficult to treat externally than regular acne of the face. The back is made of more tougher skin than the other parts of the body that are prone to acne and because it produces more oil due to the existence of thousands of sebaceous glands on the back, this excess of oil is thought to be the reason as to why back acne is usually more severe than facial acne, and often characterized by many large nodules and cysts which are also quite painful. Although there are theories claiming that back acne is the result of an excessive sun exposure (the skin becomes dry and therefore compensates the dryness by producing extra sebum which in turn clogs the hair follicles and aggravates acne) or due to lack of nutrients, the real cause of back acne is much deeper that the external symptoms. Back acne like all types of acne in all parts of the body, be that facial acne, back acne, acne on the neck or shoulders, cystic acne, blackheads or whiteheads are all caused by two major factors: hormonal imbalance and toxic build up in the blood and lymph. The fact that the back is made of tougher skin and has more sebaceous glands than other parts of the body is irrelevant to the cause of back acne. 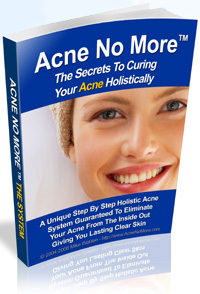 It is only relevant too the aggravation of the symptoms of acne. What I mean is that applying extra moisturizer on your back after sun exposure or limiting your sun exposure will definitely help to decrease your back acne symptoms but it will not cure your back acne. The main difference between back acne and facial acne is unfortunately not the external features of the back versus the face e.g. the back has more sebaceous glands or the skin is tougher and dryer than the face. This data can only help us with the external treatment to back acne that will handle the external symptoms of back acne. The fundamental difference between back acne and facial acne as far as the internal cause is concerned is that like most acne that appears on the body and unlike facial acne, back acne is triggered more by toxic build up in the blood and lymph than from hormonal imbalance. Toxicity is therefore a more dominant factor when it comes to back acne than facial acne. That of course doesn't mean that hormonal balance is not a factor in the back acne equation. Hormonal irregularities play an important role with every type of acne, it just less dominant when it comes to acne on the body. The conclusion is very simple: to permanently cure back acne (just as the situation is with any type of acne) you must neutralize and fix the internal problem that is causing your acne to manifest itself the first place. With back acne the focus of the treatment should be more on toxicity than hormonal imbalance but the principals are basically the same. The ideal solution to acne is the holistic path to clear skin: by tackling all acne contributing factors from within along with handling the lifestyle and external factors that aggravate your acne, you will cure your back acne permanently and enjoy lasting acne freedom, health and vigor.